36.5" x 17.5" x 10.5"
Through only a few simple shapes that constitute this crest mask, a Babanki carver has eloquently captured the stately quality of the western grassfield elephant. 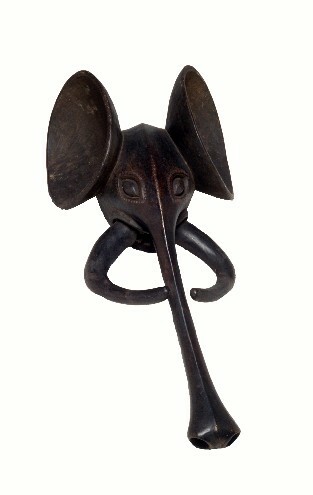 The elephant is a symbolic royal icon second only to the leader of the dance. Afforded special privilege, the wearer of the mask dances slowly and regally at memorial services for the dead. Thus its presence indicates great respect and reverence. Masks such as this would have represented a specific family lineage. A dancer with a hooded face and costumed body would have worn the mask horizontally on his head. Bibliography:Northern, 1984, p.157; Hahner-Herzog, 1998, p.68.